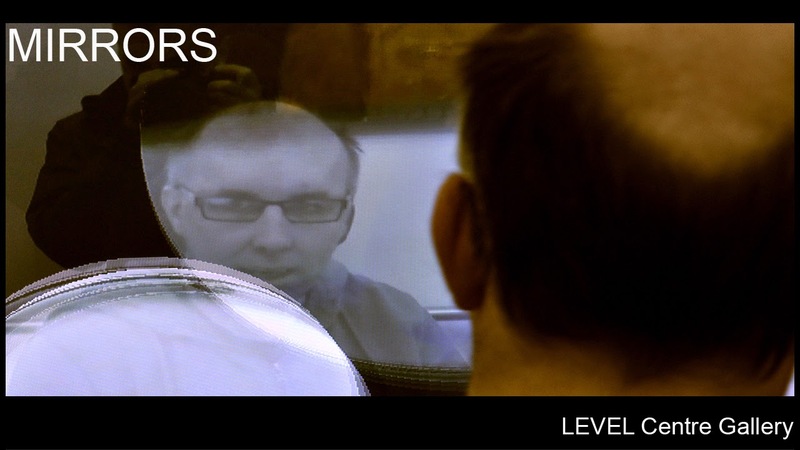 Inter-ACT + Re-ACT is a new programme of interactive exhibitions, installations and research at the LEVEL Centre. Over a twelve month period we will create and develop new art work & tools for people to interact with and react to using computer based digital media and simple, intuitive interfaces. 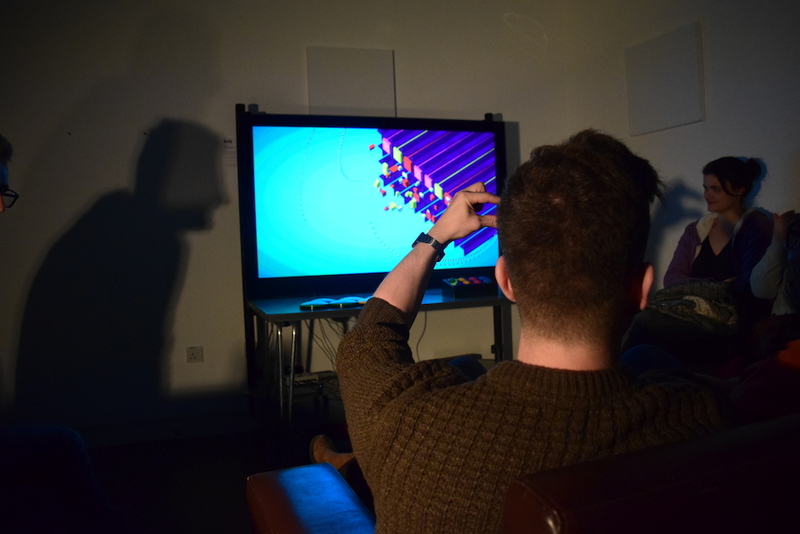 Using movement, touch & sound, visitors to the LEVEL Centre will be able to play intuitively to manipulate digital images, audio & video and perform within stimulating interactive installations/sensory environments. Re-ACT + Inter-ACT will also provide opportunities for people to create their own art works and integrate them within future installations and exhibitions. 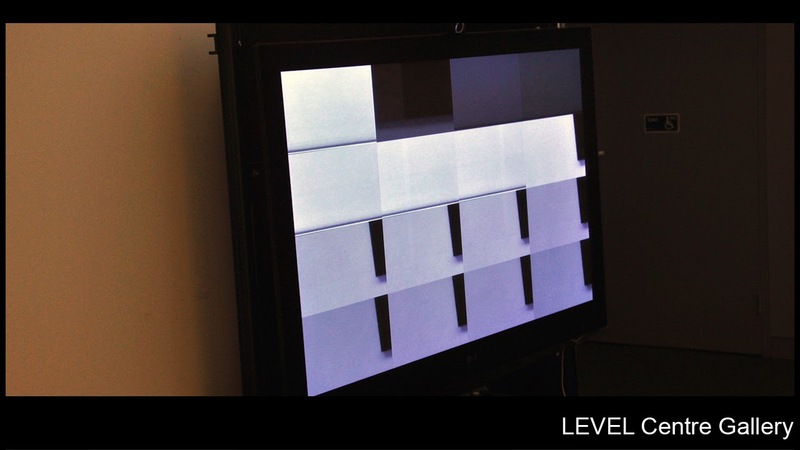 MIRRORS comprises two interactive screens (Mirror I + Mirror II). 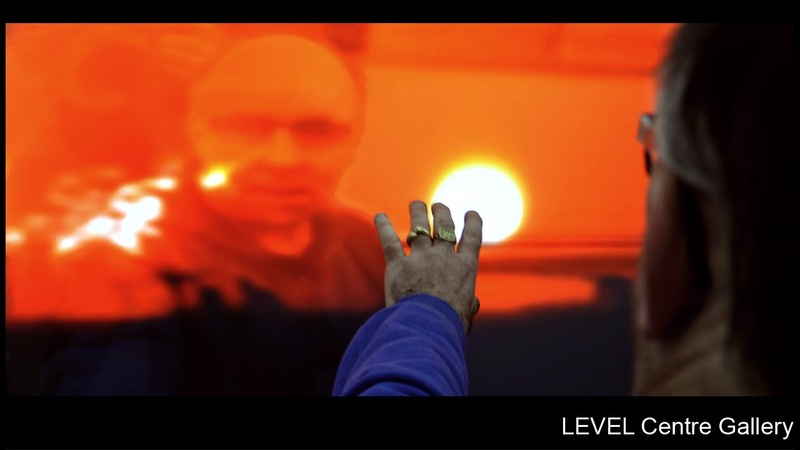 They have been created by Andrew Williams at LEVEL to provide an informal means of engagement with digital art and opportunities to respond and change the images through physical interaction as people journey through the Centre. Both screens are located in the corridor and use cameras to create a strange mirror – reflecting a digitally altered image onto the screen. The camera also acts as a sensor, providing an opportunity for people to manipulate the images seen on the screen through movement. MIRROR I is located at the end of the corridor and uses a delay in the image to create a time warp. Images seen on the screen only appear after a 40 second interval, meaning that you only see what you have done in the recent past. MIRROR II is more complicated. Located in the centre of the corridor it comprises 10 individual programmes each providing a different means of interaction. Each programme plays for 60 seconds and then moves sequentially through each one. Sometimes you may appear to be walking on the ceiling and at other times your movement may control the image on the screen. This project also incorporates a research element. By providing a variety of interactive possibilities we hope to be able to observe peoples’ motivation, reaction and willingness to engage in an informal, (non led) interactive creative process. We would like to gather more information to help inform and guide our future work. For example: Which programmes work well and how? 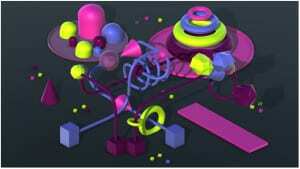 Do people spontaneously interact with the screens? How best can we develop these in the future? 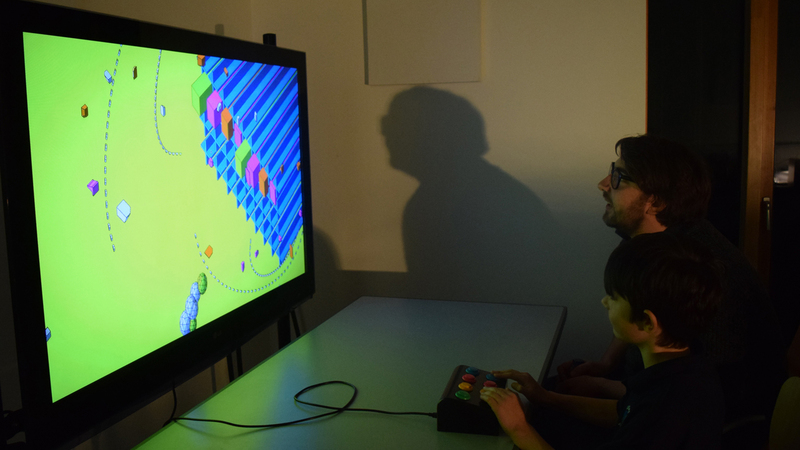 How can people creatively contribute to the future development of interactive art? Abstract Playground, created by artist Will Hurt, takes the form of a screen based programme triggered by a series of coloured buttons. When activated they animate geometric shapes, moving them around the screen together with playing a sound. This allows people to create a unique ‘real time’ audio visual composition. Will is interested in the nature and concept of Digital Space. His installation plays with this notion in an intuitive and easy to understand visual language. The shapes on the screen represent brutalist architecture, which disintegrates and explodes when activated. The screen can be rotated at any time and the colours change abstractly, both of which provide a constant variety to the relationship of shape and digital space. Although stage 1 of this project has been completed and a fully working version is up and running at LEVEL we hope to develop this work further in the future. Ideas include developing its capacity as a full musical instrument and perhaps even create a whole orchestra using several instances of the installation. Will Hurt (b. 1984) lives and works in Mileham (Norfolk) and London, UK. He uses generative programming techniques, random number generators and 3d graphics engines to create digital prints, animations and live performances exploring the nature of digital objects and their relationship to digital space. Hurt has exhibited nationally, internationally and online, most prominently at the inaugural New York Design Week. He has a close working relationship with Eglo Records and has been commissioned by them multiple times to create installations, animations and performances. He studied at The Slade School of Fine Art under Phyllida Barlow and Susan Collins. Will uses computers to create abstract digital spaces containing digital objects ranging from single, minimal, geometric forms to complex masses of thousands of objects. His work has often been resolved as generative animations, digital prints and live performances. Recently Will has also incorporated the creation of interactive apps and installations.Will sees the focus of his work lying within questions concerning the nature of and relationships between, digital space, physical space and time. What are the unique qualities of digital space? How does digital space differ from physical space? How do digital objects occupy digital space? How does a digital object navigate digital space? Can you fill a digital space? How much does a digital object weigh?Computers, programming and 3d graphics are central to his practice, creating work in realtime graphics engines, and he tends to show the work running in the engine rather than a recording of it. This allows the creation of work that has indefinite run times and never repeats exactly, both qualities specific to the medium. He is captivated by the economics of programming- and regularly employs simple algorithms that when repeated indefinitely give rise to complex, unexpected interactions. Will’s influences include Minimalist Painting, Brutalist Architecture and Abstract Film. He sees his work as a continuation of that started by the early computer artists Frieder Nake, Manfred Mohr and Larry Cuba.